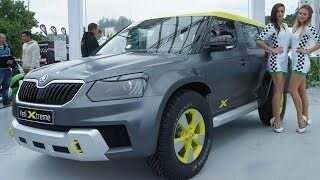 At the Worthersee GTI event, Skoda presented its Skoda Yeti Xtreme Concept 2014 based on rally car inspirations. The rugged concept can be called as company’s highly anticipated project designed in and out to treat its GTI buyers and amidst around 200,000 fans. 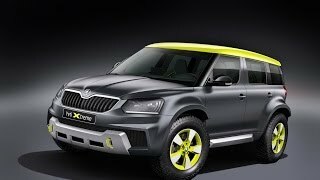 Let us have a look at the review of Skoda Yeti Xtreme Concept 2014 and get to know this new unveil better. 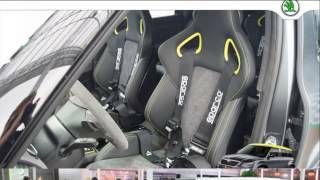 Interior of Skoda Yeti Xtreme Concept 2014 will gleam you with its amazing design. Inside all four passengers are offered Recaro Sports seats that come integrated with four-point safety belts while the inner doors are crafted and molded in carbon fiber. In front of driver is mounted a multifunctional sports-steering wheel with integrated paddle shifters. Interior of Skoda Yeti Xtreme Concept 2014 is crafted with high quality material to adore you with looks, safety and comfort. Inside in the lieu you’ll also notice a sand shovel and thermos flask integrated in paneling through holders. Apart from this you’ll also notice high end use of aluminum in designing pedals, floor panels and special door sill plates. Center console also gets a good set of revision and brings with it a fire extinguisher and belt cutter to make it look closer to its rally car inheritance. Last but very important before rounding up the details come a first aid kit placed in glove box and an iPad cradle integrated in dashboard. The remarkable designed exterior of Skoda Yeti Xtreme Concept 2014 rolls over its 17-inch alloy wheels. Starting with the front fascia of Skoda Yeti Xtreme Concept you’ll find a height adjustable chassis serving you large air intakes integrated in its aggressive looking bumper, and yes the LED headlights that indeed will steal your attention through its sleek sporty touch. Moving towards sides you’ll notice the remarkable sight through tinted windows and yellow-green inserts over roof and wheel rim. 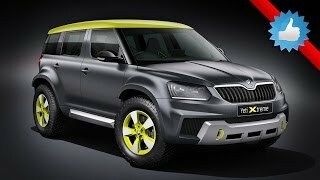 Moving towards the rear fascia of Skoda Yeti Xtreme Concept you have a muscular body that’ll speak out all you expects from a car like this. First grabbing your eyes is a muscular bumper above the two broad exhaust tailpipes. A spare wheel has been inculcated in the boot with special traction mats that can be pushed under the wheels if in any case your rally car gets stuck in mud. The Skoda Yeti Xtreme Concept 2014 hides beneath its hood a powerful 1.8 Liter TSI engine generating total output of 150 hp and peak torque of 250 nm paired to six-speed dual clutch transmission sending power to its four-wheels. While the top speed of Skoda Yeti Xtreme Concept 2014 touches mark of 119 mph and can sprint to 62 mph in 9.0 seconds.